An exchange gap in the Dirac surface states of a topological insulator (TI) is necessary for observing the predicted unique features such as the topological magnetoelectric effect as well as to confine Majorana fermions. We experimentally demonstrate proximity-induced ferromagnetism in a TI, combining a ferromagnetic insulator EuS layer with Bi2Se3, without introducing defects. By magnetic and magnetotransport studies, including anomalous Hall effect and magnetoresistance measurements, we show the emergence of a ferromagnetic phase in TI, a step forward in unveiling their exotic properties PRL 2013. In addition to the weak antilocalization cusp observed in the magnetoresistance (MR) of topological insulators at low temperatures and low magnetic fields, we find that the high-fieldMR in Bi2Te2Se is linear in field. At fields up to B = 14 T, the slope of this linear-like MR is nearly independent of temperature over the range T = 7 to 150 K. We find that the linear MR arises from the competition between a logarithmic phase coherence component and a quadratic component. The quantum phase coherence dominates up to high temperatures, where thecoherence length remains longer than the mean free path of electrons APL 2013. Three-dimensional topological crystalline insulators were recently predicted and observed in the SnTe class of IV–VI semiconductors, which host metallic surface states protected by crystal symmetries. In this work, we study thin films of these materials and expose their potential for device applications. We demonstrate that thin films of SnTe and Pb1−xSnxSe(Te) grown along the (001) direction are topologically non-trivial in a wide range of film thickness and carry conducting spin-filtered edge states that are protected by the (001) mirror symmetry through a topological invariant. Application of an electric field perpendicular to the film will break the mirror symmetry and generate a bandgap in these edge states. 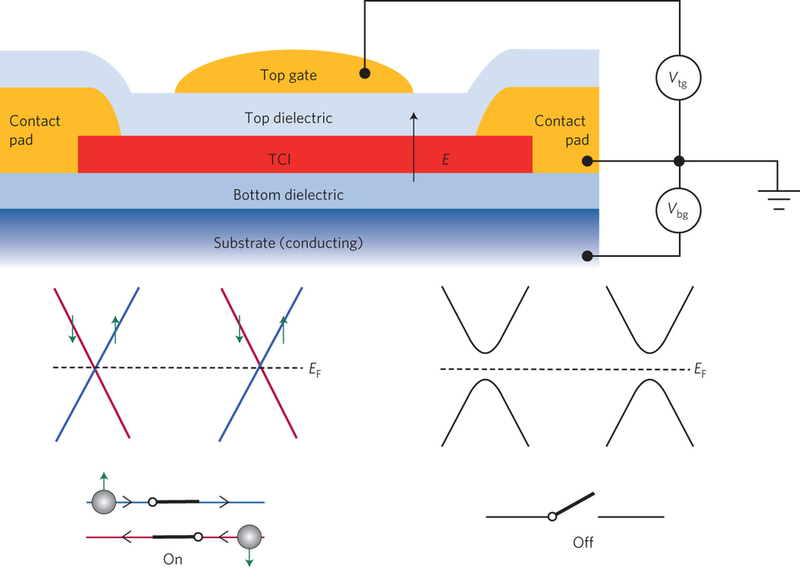 This functionality motivates us to propose a topological transistor device in which charge and spin transport are maximally entangled and simultaneously controlled by an electric field. The high on/off operation speed and coupling of spin and charge in such a device may lead to electronic and spintronic applications for topological crystalline insulators. Proposed topological transistor device for using an electric field to tune charge and spin transport. Without an electric field, the TCI film has mirror symmetry and thus protected, spin-filtered edge states (left). Applying an electric field perpendicular to the film breaks the mirror symmetry, which generates a gap for the edge states (right). V tg, top-gate voltage; V bg, bottom-gate voltage; EF, the Fermi level Nat. Mat 2014. A theoretical prediction by de Gennes suggests that the resistance in a FI/S/FI (where FI is a ferromagnetic insulator, and S is a superconductor) structure will depend on the magnetization direction of the two FI layers. We report a magnetotransport measurement in a EuS/Al/EuS structure, showing that an infinite magnetoresistance can be produced by tuning the internal exchange field at the FI/S interface. This proximity effect at the interface can be suppressed by an Al2O3 barrier as thin as 0.3 nm, showing the extreme confinement of the interaction to the interface giving rise to the demonstrated phenomena PRL 2013. The change of the quasiparticle density of states in a superconductor due to the Zeeman splitting can lead to highly responsive spintronic devices. This is demonstrated here in the magnetotunneling studies of a supercondcutor/insulator/ferromagnet tunnel junction. A tunnel magnetoresistance (TMR) as large as 36% is obtained, resulting from the conductance variation due to spin-split quasiparticle tunneling, and only occurs in the superconducting state. Our results show that in addition to the naturally existent spin imbalance in ferromagnets (upon which conventional TMR is obtained), we can manipulate tunnel conductance by tailoring spin dependent density of states with interfacial exchange fields, and even with a tunnel junction with both superconducting electrodes PRB 2013. The use of molecular spin state as a quantum of information for storage, sensing and computing has generated considerable interest in the context of next-generation data storage and communication devices, opening avenues for developing multifunctional molecular spintronics. Such ideas have been researched extensively, using single-molecule magnets and molecules with a metal ion or nitrogen vacancy as localized spin-carrying centres for storage and for realizing logic operations Nature 2013. 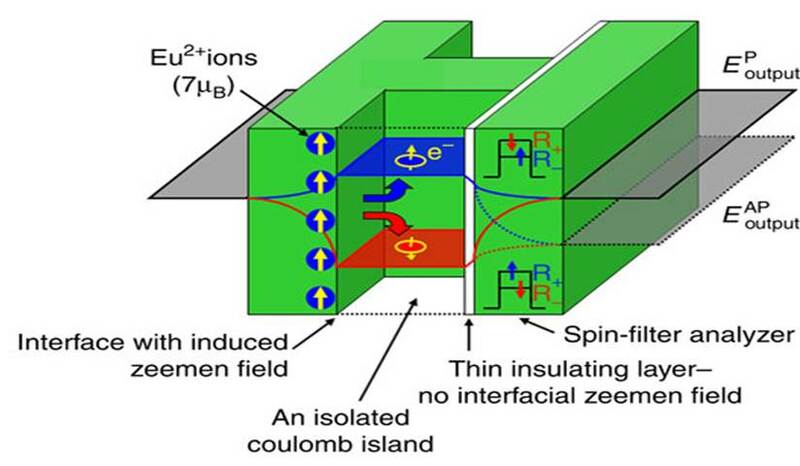 Magnetic insulators are known to provide large effective Zeeman fields that are confined at an interface, making them especially powerful in modifying adjacent one- or two-dimensional electronic structures. Utilizing this phenomenon and the other important property of magnetic insulators—spin filtering—here we report the generation and subsequent detection of a large interface field, as large as tens of tesla in EuS/Al/EuS heterostructures with metallic coulomb islands confined within a magnetic insulator barrier. The unique energy profile across this sandwich structure produces spin-assisted charge transfer across the device, generating a spontaneous spin current and voltage. These unique properties can be practical for controlling spin flows in electronic devices and for energy harvesting Nat. Commun. 2014. (a) Majority and minority electron energy bands of the two FM electrodes. (b) Typical magnetoresistance curve in a magnetic tunnel junction. (a) A double spin-filter. (b) The barrier height experienced by tunneling electrons depends on the mutual spin alignment of the two spin filters. (a) Superconducting spin valve effect in the structure (in nm): Si(100) / 10MgO / 6Fe / 40V / 6Fe / CoO. (b) Superconducting transition of the same sample in its spin P and AP configurations. Inset shows the thickness dependence of the SC spin valve effect, and an example of the MR loop with 50 nm V is also shown.